The U.S. 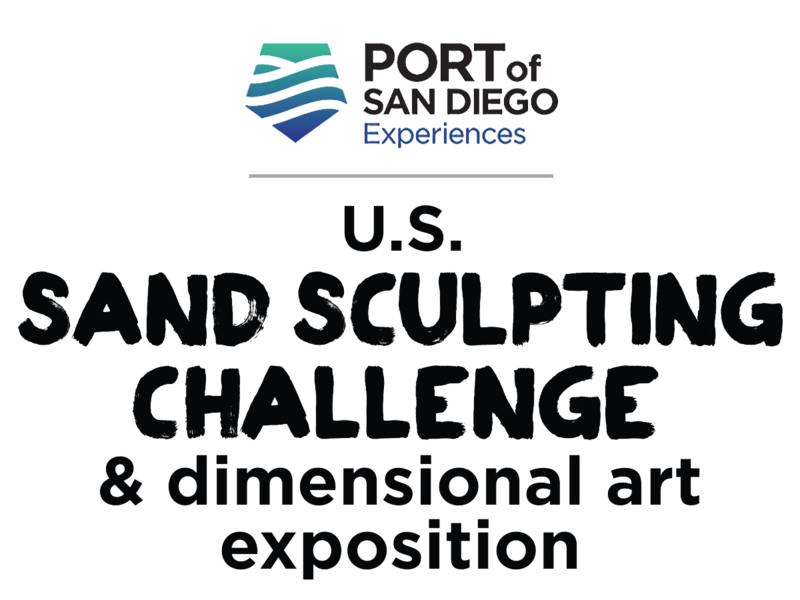 Sand Sculpting Challenge and Dimensional Art Exposition is on the Broadway Pier and Pavilion, stretching out to the Broadway Landing on the Big Bay in downtown San Diego. Address is 1000 North Harbor Drive, San Diego, CA 92101. Take the Coaster®, trolley or the bus . . . loads of fun without the fuss. Families living or staying anywhere in the County can take MTS buses or Orange and Green Line trolleys or COASTER® trains, which all stop at Santa Fe Depot, just a couple of blocks away from the Cruise Ship Terminal Beach (ummm . . . Broadway Pier). Bonus: Show your MTS ticket or pass at our ticket booth and take $2 off adult admission. (Not valid for seniors or kids who already get in cheap, or for active duty military, who get in free.) If you’re coming from Orange County or L.A., take Amtrak and you too will end up at Santa Fe Depot. If you’re coming from Coronado, take the ferry. When you disembark, you’re right here. From North County, take the 5 freeway south to exit 17 (Front St./Civic Center). Stay right onto Front St. Take Front St. to Broadway, then turn right. Take Broadway West until you’re near the Bay. Find a place to park. See below. From South Bay, take the 5 freeway north to exit 15B (‘B’ Street/Pershing Drive). Turn left onto ‘B’ Street. Go straight under the City College overpass, then go to 10th Ave. and turn left (or make a left on 8th or 6th or 4th). Go 2 blocks to Broadway and turn right. Take Broadway West until you’re near the Bay. Find a place to park. See below. From East County, take the 8 freeway to the 163 South. Freeway ends and becomes 10th Ave. Turn right at Broadway and head toward the Bay. Downtown has many additional lots, as well as much available parking on the street grid system. You should be able to park within a few blocks of our location. Do not park at curbs that are painted red or white at any time. Blue curbs are designated for handicapped parking only. Saturday rules: Parking meters must be fed. Do not park at curbs painted yellow (commercial plates only are okay) or green. Sunday and Labor Day Monday rules: On City streets, parking is free. You need not feed the meters. You may park at curbs painted yellow or green for as long as you like. The Port of San Diego’s Broadway Landing, Pier and Pavilion are all handicap accessible. Pull up at the white curb (see ‘Share a ride’ above) to discharge handicapped passengers. While there is no parking at the site, there is parking nearby. (See ”Parking’ above.) All MTS transit is of course handicap friendly. But transit riders must navigate about 2 blocks to the event site. There’s enough to do downtown for the whole weekend. C’mon down and play! Harbor Drive is home, not only to our international sand sculpture and art expo extravaganza, but also to the fabulous new Waterfront Park and Maritime Museum to our North, to the Wonderspaces exhibition in the ‘B’ Street Pier terminal, and to events at the U.S.S. Midway aircraft carrier museum and world-famous Seaport Village and Headquarters complex to our South. (The latter is a wonderful recreation of San Diego’s old police headquarters, with great shops, restaurants and, of course, a jail for you to enjoy, if only briefly.) Little Italy is 3 blocks East and about 5 blocks North of our event. The Gaslamp Quarter is a dozen short blocks East and just 1 block South. Official Hotel of the event is the Sofia. It’s a wonderful boutique hotel on Broadway between Front St. and First Ave. (a pretty 6-block walk from the event site). There’re only 102 rooms at this charming property, so book early. Click on the logo to go to the hotel site, fill in your stay dates, plug in the word ‘sand’ in the promotion code blank and find an unbelievably reasonable rate for a central downtown boutique hotel. Enjoy the Big Bay on Labor Day weekend. Get down downtown! This is, after all, the last great holiday weekend of Summer!